An indepth study of the Breath, Bandhas & Asanas and how the physical practice of yoga can give you an experience of your heart and soul. Start or improve your Daily Practice - Safely, Correctly & Comfortably! How to start/upgrade your 40 day or more Sadhana(daily practice). Come learn and practice the basics from which all asana, meditations, proper breathing, good posture and health start. Then apply these techniques to some of the more challenging Kriya's, Pranayamas and Meditations. Challenge yourself correctly, without hurting your body. We will practice, with ease and at our own level: So Darshan Chakra Kriya, Bound Lotus, BackBends & Answer Questions about other Asanas. Saturday April 11th GuruPrem will teach Divine Alignment & The Heart Rules Workshop - Discover the secrets of your sacred core, and how small adjustments, can reset and realign your base, thus setting your foundation to bring you into Divine Alignment, allowing you to more easily heal the wounds of your heart. Learn where and how to use this area to leverage your vitality allowing it to move towards your seat of virtues, your Heart Center! Learn the fundamental Bandh's (Locks) that are to be applied to maximize the benefits of the Kriya's and meditations as well as the proper Angles and Triangles of Kundalini Yoga and all movement. Beginners & Advanced practitioners alike will benefit from this short workshop. 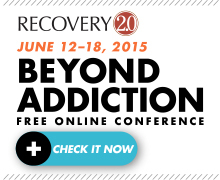 Recovery 2.0 Please join me for the Recovery 2.0 #MoveBeyond Addiction Conference! 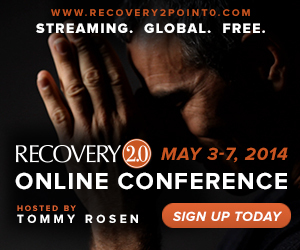 This is a FREE global online event from June 12-18, 2015, bringing together the voices of 25 experts and thought leaders on recovery and addiction. The conference is hosted by Tommy Rosen, the author of the acclaimed book: Recovery 2.0: Move Beyond Addiction and Upgrade Your Life. You'll get access to cutting-edge interviews full of inspirational, spiritual, medical and practical approaches to overcoming addictions of all kinds. There is hope. These teachers inspire and support people struggling with addiction, their families and loved ones, as well as those who work in the field of recovery. You will leave more aware, more empowered, and with the tools you need for successful recovery, optimal health and a life of fulfilling purpose... BEYOND ADDICTION! Register for the live-streaming video conference. Sign up for this Amazing Free Series Now! 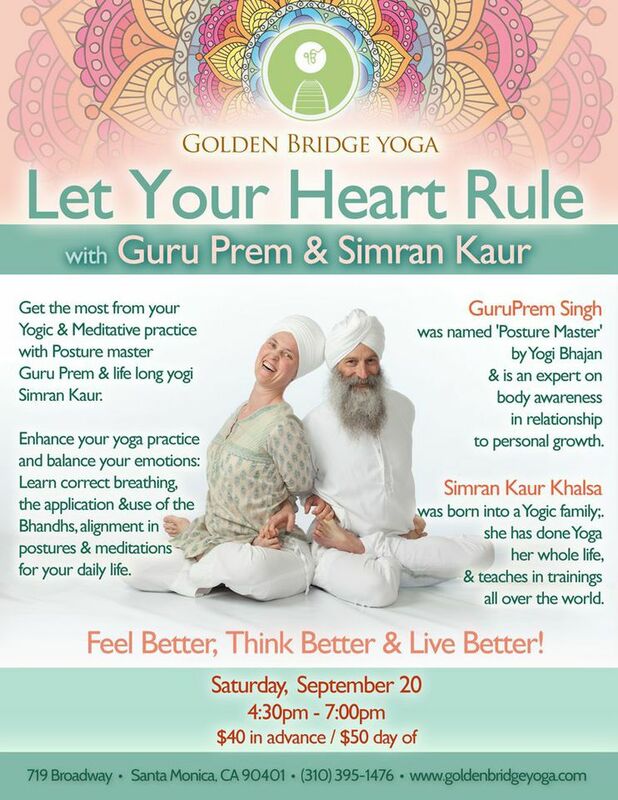 Simran & GuruPrem's first time teaching in Santa Monica at the beautiful Golden Bridge Yoga! Get the most from your Yogic and Meditative practices. Balance your emotions, Learn correct breathing, the application of the Bhandas and correct alignment in your practice and in your daily life! The Heart Rules ~ Divine Alignment ~ Everyday Devotion in motion! 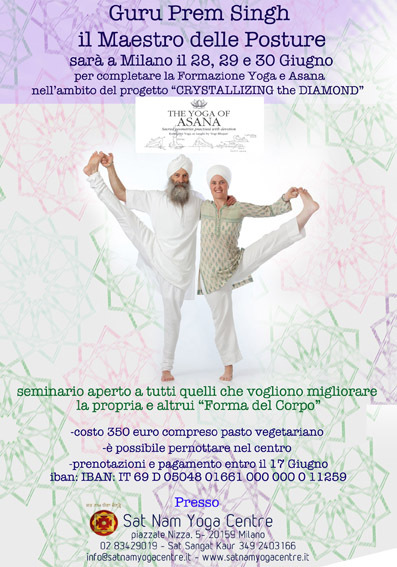 Sunday - Yogic Lifestyle with Amrit Singh, PhD. - 9am - 4:30pm includes Guru Singh's class! A 12 hours immersion, join a community of yogi's, wanna be's and newbies! An indepth study of the Breath, Bandhas, Dritshi & Asanas and how the physical practice of yoga can give you an experience of your heart and soul. Summer Solstice NM, Secrets of the Sacred Core Monday June 23trd: 7am-8:15am Air Tent With Live Music! Secrets of the Sacred Core ~ Come discover a Master key that will allow you to be the True You, be divinely aligned, have navel intelligence, be open-hearted and empty headed! Use Divine Alignment to open your hips, heal your heart and experience ease. Learn how to have a more powerful, comfortable and transformational experience with your practice. Two powerful kriya’s and a Heart Healing Meditation. A must for an easier White Tantric Yoga® experience. The Heart Rules Workshop with Simran Kaur and Guru Prem Singh Join the Teachers in Training program for an indepth study of the Bandhas & Asanas and how the physical practice of yoga can take you to your heart and soul. GurPrem is also available April 12 & 13 for a limited number of private session yoga tutorials while he is in NY, call Simran Kaur 310-801-0990 to book a private. Cost $140 for an hour session. Teacher Training for a study of the Breath, Bandhas, Drishti & Asanas and how the physical practice of yoga can help you achieve that experience of union of the Body, Mind and Spirit! Thursday April, 17th Opening the Heart with Music by Mirabai: Discover the secrets of your sacred core, and how small adjustments, can reset and realign your base setting your foundation to bring you into Divine Alignment, allowing you to more easily heal the wounds of your heart. Saturday April 19th Divine Alignment to Let your Heart Rule! Come awaken to the power of your sacred core learning where and how to use this area to leverage your vitality moving it towards your virtues! Learn the fundamental Bandh's (Locks) that are to be applied to maximize the benefits of the Kriya's and meditations and the proper Angles and Triangles of Kundalini Yoga and all movement. Beginners & Advanced practitioners would benefit from this short workshop. Learn the wisdom of the sacred within you, how to practice Asana from a comfortable seat. How to obey your breath, relate to gravity with Ease & have your Heart Rule and be in Divine Alignment. Heart Rules Workshop ~ Divine Alignment ~ Everyday Devotion in motion! GuruPrem & Simran will be teaching a Special Course Asana, Postures, Breath, Bandhas & Mantra! After 21years of chanting and singing together at Solstice, Gurdwara and at Yoga Courses, YogaWest Los Angeles asked us to come and lead a 2nd Chant Night! Simran Kaur and Guru Prem Singh are so excited to be gathering in the company of the holy to chant and sing together. We hope you can join us for a beautiful evening of chanting, singing, songs & stories! Yogi Tea and cookies! 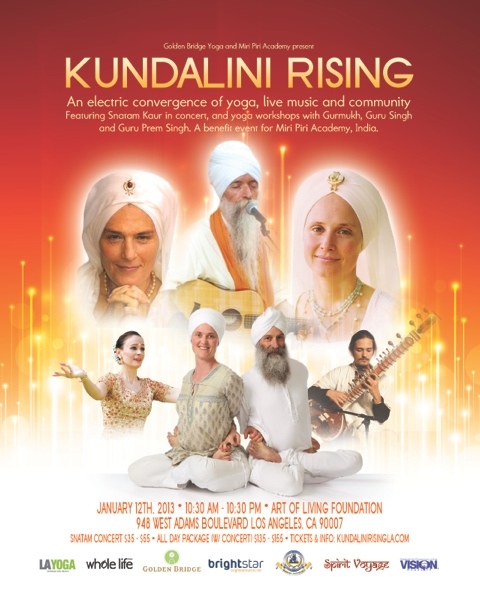 Kundalini Rising! Special All Day Yoga Event & Snatam Concert! GurPrem is also available February 3rd & 4th for a limited number of private session yoga tutorials while he is in NY, call Sat Jivan Kaur at 212-995-0571 to book a private. Cost $140 for an hour session. GurPrem is ONLY available February 2nd & 3rd in the morning for a limited number of private session yoga tutorials while he is in NY, call Simran Kaur 310-801-0990 to book a private. Cost $150 for an hour session. TDL Presents: The Love & Relationship WORKSHOP! What if one day could change the course of your Love life, forever?